Embark on a playful adventure where the Japanese cuisine will leave you with a smile on your face and four lucrative features please you with winnings. In this comical slot, joyful ingredients will keep you entertained while reels collapse, wilds multiply, second chances are given and free spins turning symbols into wilds show the path to riches. As adults we unfortunately have to live by certain social codes, but thanks to NoLimit City, we can once again play with our food without being ashamed and even be greatly rewarded for it! 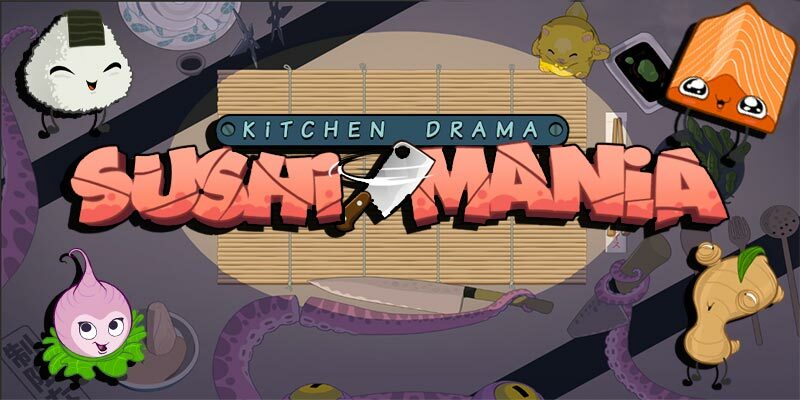 Kitchen Drama: Sushi Mania is quite an amusing slot where lively ingredients unaware of their bitter destiny spread joy over the reels which are impressively designed as a wooden chop board. You’ll get to experience the last breath of a happy salmon, pleased onion, cheerful rice and a retard looking parsnip, as whenever part of a winning line, these ingredients are sliced into bits, going to the grave with quite a humorous facial expression. The game is undoubtedly a high quality one with a comical theme that is perfectly executed, offering an experience out of the ordinary, which is always a winning recipe for fun. Along with the slot’s lovely visuals, you’ll get to enjoy a catchy tune and playful sound effects that are just as fabulously designed. It’s a medium volatile slot where low and medium sized winnings are regularly being paid out from a cloning wild symbol that is frequently appearing. With a lucrative free spin feature that can be triggered to turn three entire symbols into wilds, it is however possible to cash in big as well and win up to a nice 697 times your bet amount. Along with the above two features, you’ll get to experience collapsing reels where symbols part of a winning line are replaced by new ones, as well as second chance feature that creates an opportunity to form winning combinations on a no win-scenario. To learn more about these features, the game’s payouts and to find interesting statistics of big wins and feature activations, check out the rest of the review as we have everything you need to know about this food fantastic and amusing slot covered. On the contrary to its innovative visuals, Kitchen Drama Sushi Mania has quite a traditional reel design as you’ll get to spin 5 reels that have 3 rows each. On these you’ll find 20 fixed paylines. The game speaks to anything from low wagering food sadistics to sushi craving high rollers and everyday thrill seekers as you’ll find plenty of stake options to choose from. There are a total of fifteen different ones with the betting range starting at €0.2 and going all the way up to €100. While spinning the reels in this humorous food adventure, you’ll encounter two different wilds and eight regularly paying symbols represented by various ingredients. On a single winning line of five, these symbols can pay anything from 2.5 up to 25 times the stake. 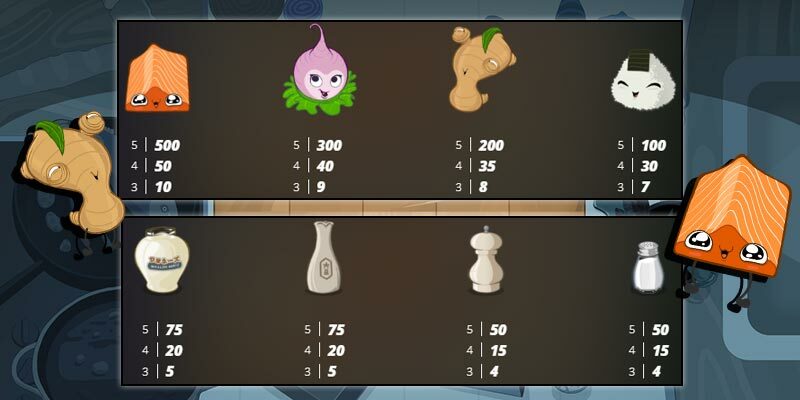 The symbols in the image show the regularly paying ones and as you can see the salmon is the one you’d really like to cross your fingers for, followed by the joyful onion and dim-witted parsnip. Note that all of the payouts are listed in coins and that every game round consists of 20 coins regardless of your stake options. This means that the salmon will reward you with 25x your stake on a winning line of five, whereas the happy rice will give you a 5x win. When it comes to the two wilds that you’ll also find in the game, these both substitute for all of the above symbols. 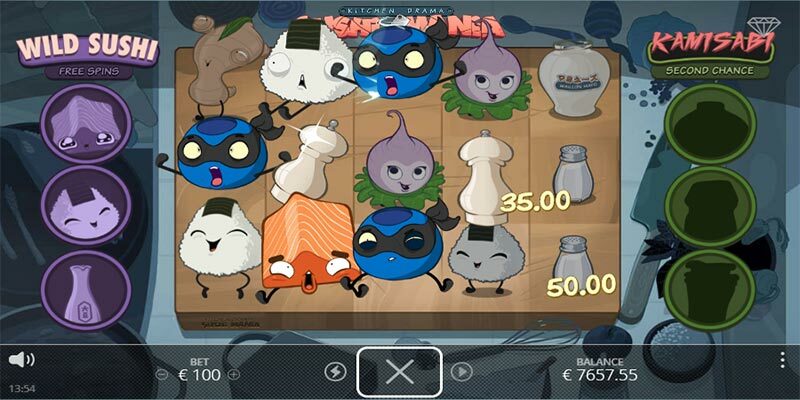 One of the wilds is represented by a samurai and frequently appears, while the other one, represented by a sushi roll, can only show up as part of the game’s free spin feature. During your playful visit to Kitchen Drama Sushi Mania, there’s never room for boredom as something exciting’s always happening. You’ll constantly get to experience Collapsing Reels and Bunshin Wilds, while a Wild Sushi Free Spin and a Kamisabi Second Chance feature will trigger at occasional intervals. The collapsing reel feature is triggered on every winning spin and allows you to get multiple winnings during the same game round as those symbols that were part of a winning line will be chopped to pieces and then replaced by new ones. It’s a type of re-spin feature that can go on and on forever as it will continue to trigger as long as winning combinations occur. The Bunshin Wild is a symbol represented by a samurai and will frequently appear on the reels to increase the chances of winning combinations. Whenever the samurai shows up, he will create two additional copies of himself that will randomly spread to other reels. In other words, for every Bunshin Wild appearing, you’ll get three wild symbols on the screen. The Wild Sushi Free Spins is the feature you’d really like to get your hands on as this is where most of the big wins are made. This will trigger whenever you manage to win on the soy, rice and salmon symbol during the same game round, which includes all winnings that are part of the collapsing reel feature. 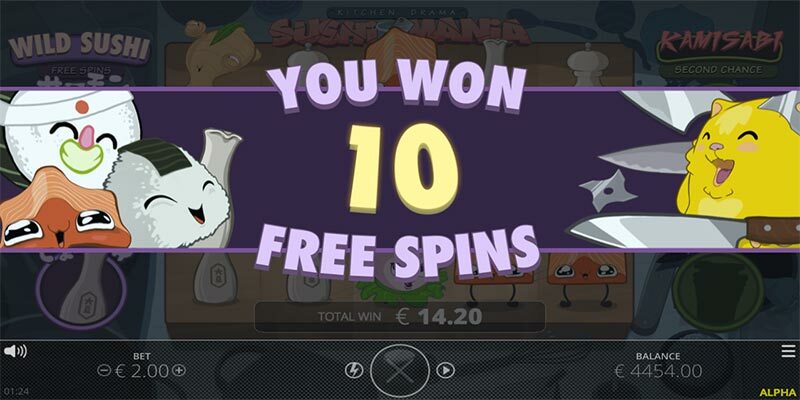 You’ll be rewarded with 10 free spins and during these all of the three ingredients that were required to trigger the feature can be turned into sushi wilds. There are three levels to reach and for each level a winning line with the salmon, rice or soy sauce needs to occur three times. The soy symbol is the first one that will turn into a wild once three win requirements are met, which is great as this is the most frequently occurring symbol of them all, making it easier to reach the two other levels. The soy sauce is followed by the rice at level two and lastly the salmon at level three. Should you manage to turn all three ingredients into wilds by getting a total of nine winning lines with them, there’s great winning potential as wild symbols are likely to cover big parts of the screen on every spin. To increase your chances of scoring winning lines and getting to the lucrative free spin feature, the Kamisabi Second Chance will trigger whenever three consecutive wins have occurred during the same game round and no more winning lines are formed. As the name reveals, the feature will give you a second chance to hit yet another win by replacing 4 to 6 symbols on the first three reels. There’s no limit to how many times the feature can trigger, which means that the reels may collapse for quite some time if you’re lucky. While enjoying the food sadistic slot, you can expect to frequently hit smaller wins as those ranging between 2x – 5x your bet value make up the biggest part of the slot’s total RTP. With a medium volatility level given a developer value of 5 out of 10, medium sized winnings ranging from 5x up to 100x do however also make up a lot of the game’s payback percentage. On average it takes 90 spins to hit a 15x win and 1708 spins to hit a 100x one. While waiting for these you’ll encounter a lot of the smaller sized winnings as the slot has a 29.45% hit frequency, meaning that you on average will get a win on a little less than every third spin. Many of the smaller and some of the medium sized winnings will come from the Bunshin Wild feature as the samurai wild appears as often as once in eight spins, spreading himself over the screen. The collapsing reels triggered on every win and the second chance feature which on average kicks in on every 45th spin will however also contribute quite a lot. playful adventure is capped at 697x your stake. You’re most likely to reach these riches and other high paying amounts in the wild transforming free spin feature, which you on average get to enjoy on every 144th spin.